One of several surviving compendia in the form of a book, this example tries to imitate the form more closely than most: the spine is curved with two projections for the bindings, the edges are lined to give the appearance of pages and two book clasps fasten it shut. Although unsigned, the compendium is attributed to Christoph Schissler: it matches his signed pieces both decoratively and in terms of its individual elements. 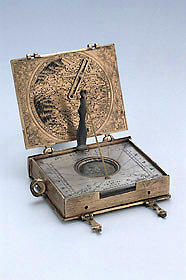 There is a geographical astrolabe, a horizontal string gnomon sundial with three latitude plates, a compass, lunar volvelle and orthographic planisphere. In addition, there is a map which, unlike his other surviving examples, centres on France rather than Central Europe. The geographical shift is confirmed by the inscriptions in a mixture of French and Latin. Presumably the piece was commissioned for or by a French client. © Museum of the History of Science, Oxford. All rights reserved. Information and images provided here may not be reproduced in any form or by any means without the prior written permission of the museum.